It is always fun to take a nice, long bath after a particularly long and hard day at the office. Of course, what’s better than soaking in a warm bath with your favorite aromatherapy candles burning, while you have a glass of milk and some cookies at the side to munch on, reading your favorite book in another hand? Why, some of your favorite tunes would always come in handy! 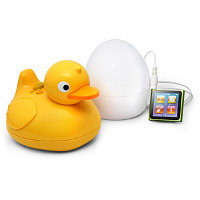 Enter the iDucky waterproof floating bath duck that not only functions as a speaker for MP3 players, it also doubles up as an FM radio to boot. It is compatible with any device as long as it is connected via the 3.5mm headphone jack. Retailing for $29.99 a pop, the iDucky is powered by a couple of AAA batteries, and will feature an egg transmitter that has a 10 meter working range – that ought to be enough to work with most bathrooms unless you live in a mansion.